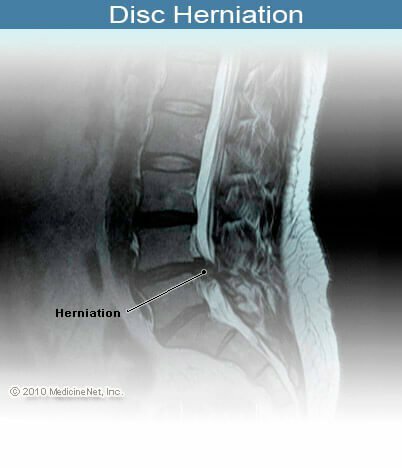 Herniated disc: Rupturing of the tissue that separates the vertebral bones of the spinal column. The center of the disc, which is called the nucleus, is soft, springy and receives the shock of standing, walking, running, etc. The outer ring of the disc, which is called the annulus (Latin for ring), provides structure and strength to the disc. The annulus consists of a complex series of interwoven layers of fibrous tissue that hold the nucleus in place. A herniated disc is often referred to as a slipped disc. This term came from the action of the nuclear tissue when it is forced from the center of the disc. The nuclear tissue located in the center of the disc can be placed under so much pressure that it can cause the annulus to rupture. When the disc has herniated or ruptured, it may create pressure against one or more of the spinal nerves which can cause pain, weakness or numbness in the neck and arm. Other names for herniated discs are prolapsed and ruptured discs.